. . . cried wee, wee, wee; all the way home. 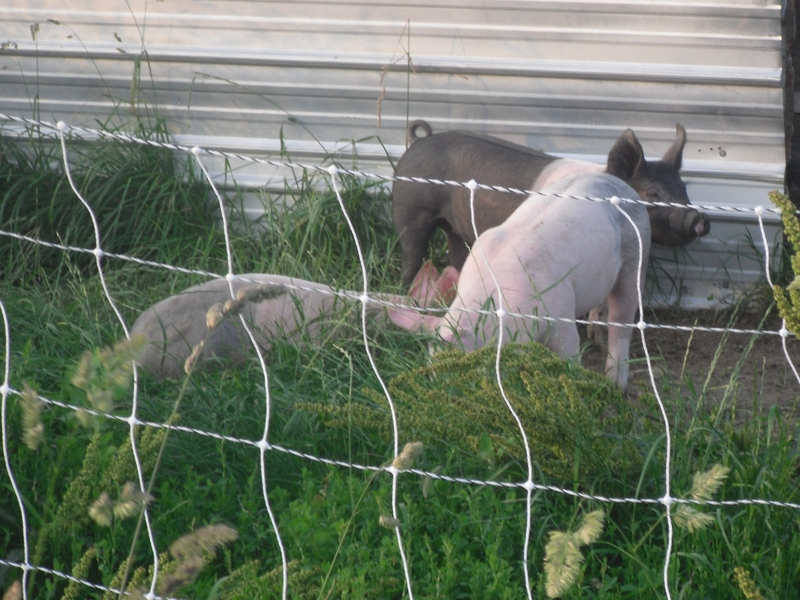 Saturday I drove down near Seymour to pick up three feeder pigs. While our first experiment with raising pigs did not work out, there is a demand for pork that we have decided to tap into with feeder pigs. We are starting with three to get our system worked out. The plan is for the pigs to follow the sheep and cows through the pasture. We would like to run them all together but the feed and shelter needs of the pigs cause issues with the other livestock. In addition to the pigs, we also picked up a new milk goat Sunday afternoon and the turkey eggs started hatching Sunday night. We appreciate your support at the markets. For the most part, they have been quite successful for us. The problem is, we weren’t quite geared up for such support. We will likely sell out of lamb, goat, and chicken this month. That will only leave us eggs, of which we have plenty. We are doing our best to supply your local, organic food needs. We will have some additional lamb and our first beef available in July. We also plan to have more chicken and pork available in October. If all goes well we will also have three or four turkeys available for Thanksgiving. Please also support the Decatur Township Farmers’ Market at 5106 S. High School Road, Tuesday, June 18, 4:00 p.m. to 7:00 p.m.